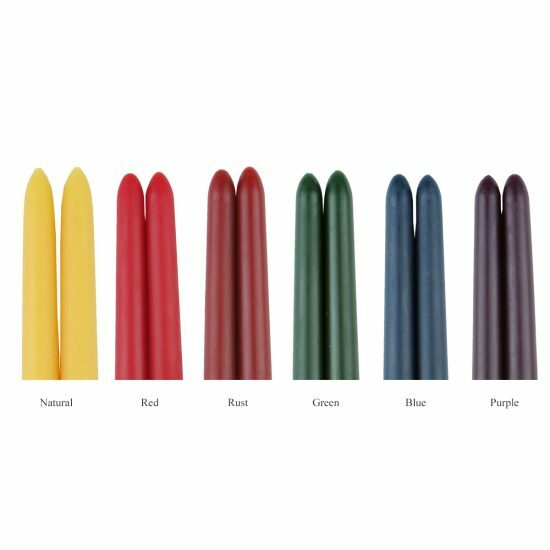 Our solid beeswax taper candles are hand poured using lightly filtered 100% pure beeswax from the USA. 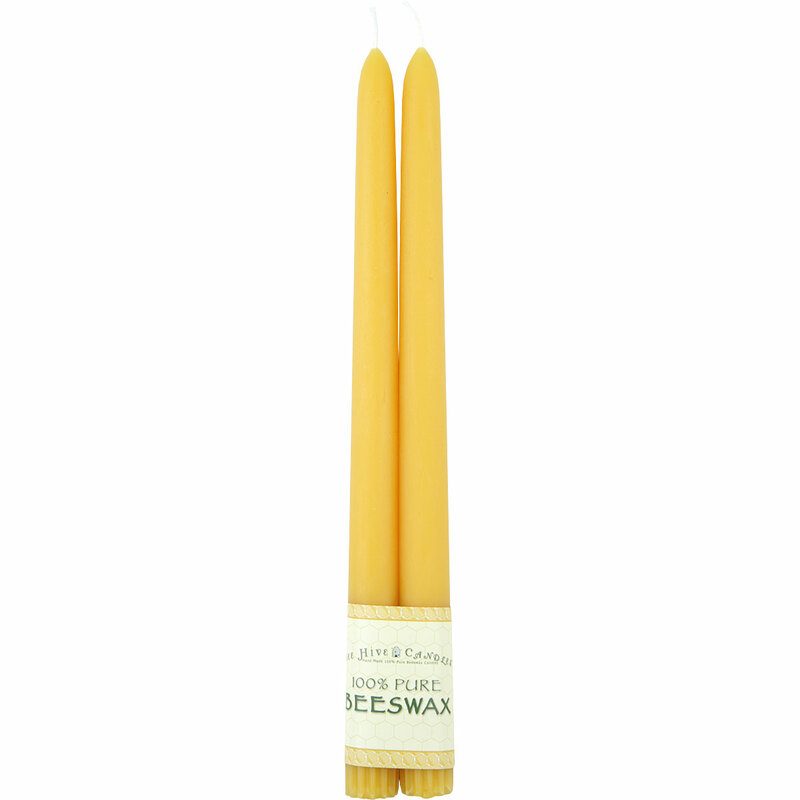 All of our beeswax tapers are clean burning & dripless. 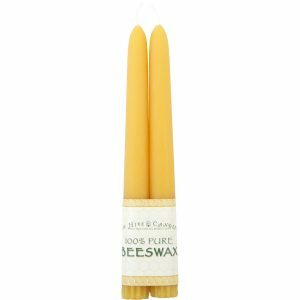 Each hypo-allergenic beeswax taper candle uses a lead-free 100% cotton wick. 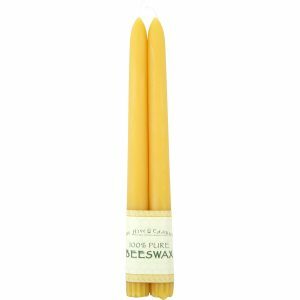 Add the finishing touch to your table setting with these elegant beeswax taper candles. Show your romantic side and light up the face of the one you love with a set of tall taper beeswax candles. Tapers are nicely suited for dinner tables and fireplace mantles. Are these tapers intended as gifts? If so, please select "Label each Pair: Yes" from the Labeling dropdown. When Yes is selected we'll wrap each pair of tapers with their own label. Generally we wrap tapers together in multiple pairs using a single label to avoid paper waste. 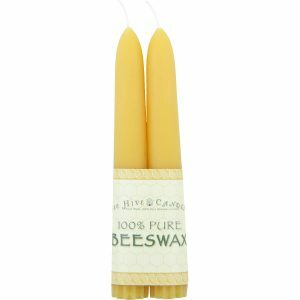 We hand pour all of our beeswax taper candles. The dimensions listed are an approximation and will vary slightly for each candle. Please consider each candle a work of art. Our tapers have an approximate base width of 7/8" and fit most standard size taper holders. Our color-added beeswax candles (Red, Green, etc.) contain a very tiny amount of candle dye to achieve their vibrant colors. Shade may vary a little between each batch. The dyes do not contain hazardous solvents or additives (such as naphtha or naphthalene used in other dyes). No dye ingredients are on the California Prop 65 list of cancer causing ingredients. Place securely in a taper holder when burning. Keep taper vertical to avoid drips. Use a candle snuffer to extinguish the candle flame mess free. 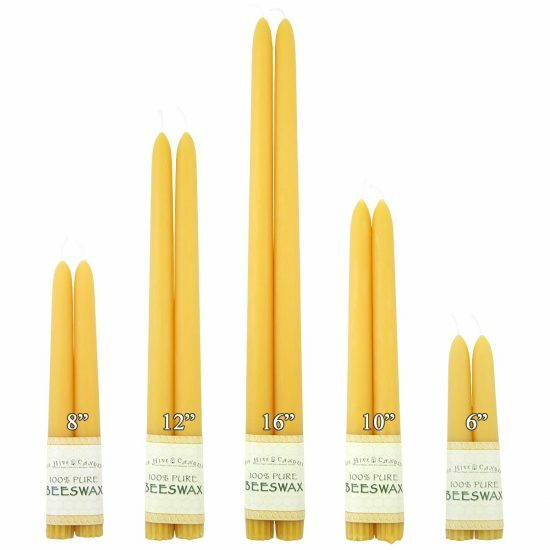 See Beeswax Taper Burning Tips for more tips.